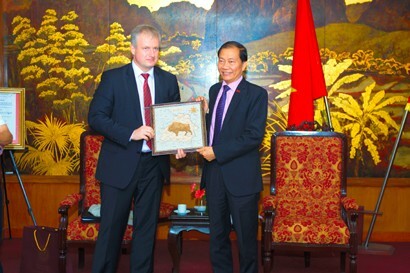 Mr Hoang Quang Phong, Vice President of the Vietnam Chamber of Commerce and Industry (VCCI) recently hosted a meeting in Hanoi with Belarusian Deputy Minister of Economy Aleksandr S. Ogorodnikov. The two leaders discussed cooperative opportunities between Vietnamese and Belarusian business communities. VCCI Vice President Phong, spurred by fine traditional friendship and cooperation ties between Vietnam and the former Soviet Union, the relationship between Vietnam and Belarus has developed well and the two sides regularly exchange high-level delegations; stage close cooperation and mutual support at the United Nations, Non-Aligned Movement, and other international forums and organisations. In addition, Belarus is a member of the four-member Eurasian Economic Union (EAEU) including Russia, Belarus, Kazakhstan and Armenia with a total population of 182 million, he said. According to EAEU experts, Vietnam's trade value with this bloc will reach US$10 - 12 billion by 2020. Therefore, the two countries need to be more active to seek investment and cooperation opportunities in the fields they have individual strengths. The two sides should take full advantage of EAEU FTA as this pact has already been signed by Vietnam and EAEU, opening up great opportunities for Vietnam's major exporters to penetrate and conquer the vast EAEU market. Vietnamese companies need to focus on exporting their strong products such as agriculture, forestry, seafood and furniture. Meanwhile, Belarusian Deputy Minister of Economy Aleksandr S. Ogorodnikov said that Vietnam is one of key customers, reliable business partners in ASEAN. And, in the future, the Belarusian government also plans to promote cooperation in machine manufacturing to not only supply the Vietnam market but also export to the ASEAN market. Specifically, many Belarusian companies will carry out machinery manufacturing cooperation projects with Vietnam. They will use high-quality European technologies and join hands with Vietnamese partners to make reasonable machines of European standards in Vietnam. Furthermore, they are also planning to seek joint ventures with Vietnam to manufacture mechanical products, especially those used for mining, energy industry, automobile assembly, agricultural machinery and information technology. Accordingly, Belarussian companies will cooperate with Vietnam National Coal, Mineral Industries Holding Corporation Limited (Vinacomin) to make high-capacity mining vehicles. In addition, he highlighted the importance of economic and commercial cooperation between Vietnam and Belarus by citing the surplus value in cooperation between Au Viet Company of Vietnam with Belarusian businesses. In addition, Mr Aleksandr S. Ogorodnikov expressed his hopes for the upcoming first meeting of the Vietnam - Belarus Intergovernmental Commission and for VCCI’s assistance to link Vietnamese investors and businesses with those from Belarus. TheEuropean nation also selected 47 typical businesses for this economic event, which may engage representatives from the Belarusian Chamber of Commerce and Industry to seek out more investment and business opportunities in both countries.